Today Rockstar Energy Drink and Codemasters announced the Rockstar Energy Race Challenge for GRID 2, powered by Racenet, the online community hub for Codemasters Racing games which tracks your races, rivals and rewards. Each week for five weeks from June 7th, players who have signed to RaceNet can enter a weekly Rockstar Energy Global Challenge on GRID 2 which will put their racing skills to the test. 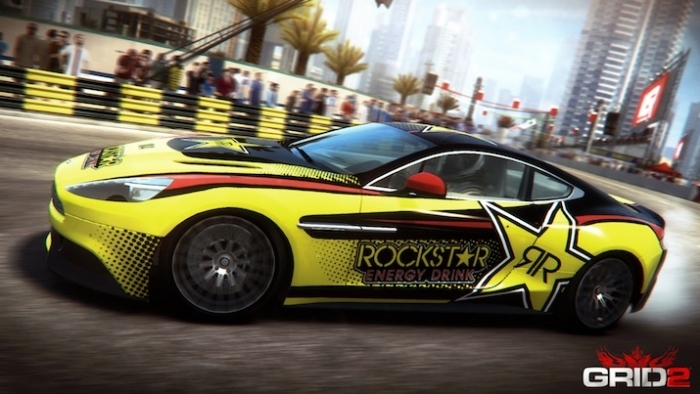 Each participant will also receive a Rockstar liveried Aston Martin Vanquish for entering and the top ten placed contestants will take home bragging rights and swag, including a year-long supply of Rockstar Energy Drink, Skullcandy headphones, T-shirts, sunglasses, $100 GameStop gift card and more. To celebrate GRID 2's release, Rockstar Energy Drink is also holding an online sweepstakes where gamers can enter to win a Rockstar edition Xbox 360 video game and entertainment system from Microsoft, a copy of GRID 2 and a year's supply of Rockstar Energy Drinks. The sweepstakes runs through June 30, 2013. Go to win.rockstarenergy.com/grid2 to enter. GRID 2 is available now for the Xbox 360 video game and entertainment system from Microsoft, PLAYSTATION 3 computer entertainment system and Windows PC. Fans can keep up with all the latest updates straight from the studio by speeding over to http://www.gridgame.com.